The original process photo series from the first few years of the site (2004-2007) are now here, below. Please feel free to contact me with any questions. 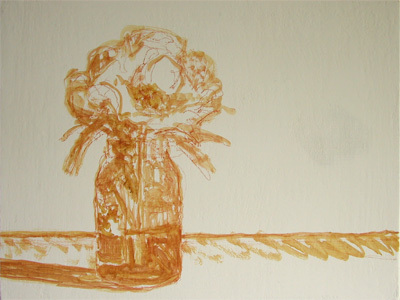 Simple sketch in trans mars yellow picking up the red chalk drawing. First layer of color, lighter than it will be but looking for the correct feeling of the light. Note how the background has encroached significantly on the flower. Finished painting, tremendous tension between observation and accident on an overcast day in June. 12x16 inches, oil on gessoed line over panel. 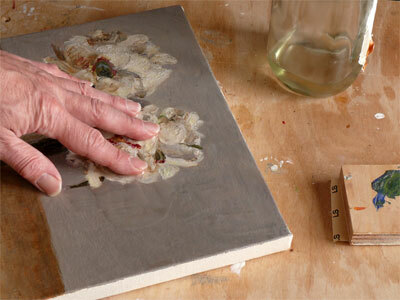 An interesting technique one comes across in the older writing is the recommendation for a painting in progress to burnish the paint film with a cuttlefish bone before continuing on it. Working on panels, I've found I can simply use sandpaper, technique illustrated below. 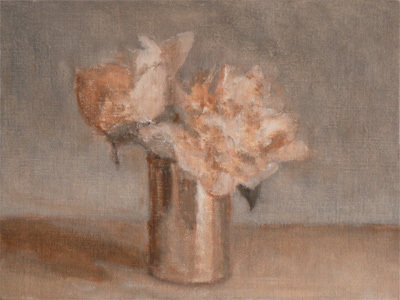 First layer on a small floral study, used as a vehicle for a technique experiment. I put a tremendous amount of putty-enhanced paint on it with the idea of working it the next day while still wet. But, having made an adjustment in the imprimatura-couch from thickened walnut to thickened linseed oil, it was dry the next day. Surprise. Looked at it for a week or so but felt it could really do with more. But the initial layer had been quite fat in spite of the putty medium, and the result was very shiny. From experience I knew that this surface would not take further paint well: grinding it back will create a more receptive surface and an ability to adjust edges more freely. A small amount of oil is rubbed on the surface. A block with 200 grit sandpaper was chosen to do the deed. In this I wanted to grind way back; with something more close to finished I'd use 400 grit, before a final layer 600 grit can be helpful. 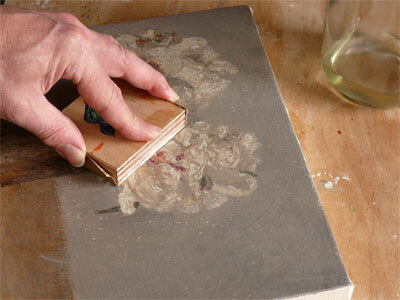 After grinding the surface is wiped dry with a rag, then buffed with a clean rag to get rid of all the excess oil. The surface is now matte, and much more plane. A little sad, but the false finish has been dispatched, something new really wants to happen on this now. Next layer. Beginning to cover everything again, making the necessary adjustments, all the bare spots are covered, the worst is over. The paint can be laid on pretty loosely and adjusted for smoothness at the end. Where it ended after the first day or re-working. Where it ended after the second day or re-working. The surface was relatively tarry which enabled finer adjustments. This will probably get one more thinner layer of paint to finish it up, possibly two. But was able to resolve the fundamental issues that the first enthusiastic layer which dried too soon had introduced. Palette for this was earth colors augmented with small additions of nickel titanium yellow, pyrol red, and cobalt blue. 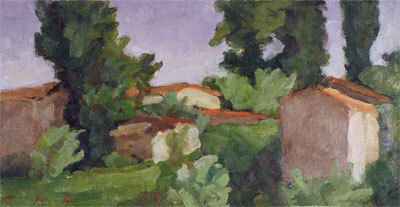 While alla prima landscape is great outside, it's not always possible. This has led me to try many variations on an alla prima technique inside. 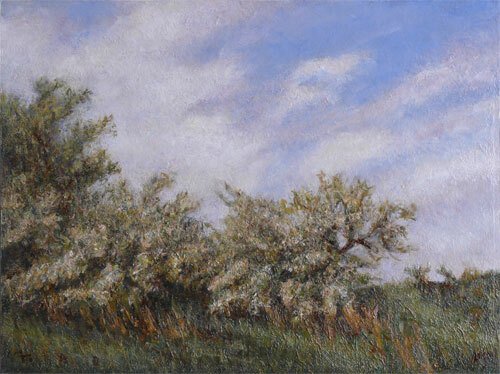 This small -- 10.5x14 inches -- study on gessoed paper was done quickly using paint that had been thickened with a small amount of amber varnish I learned to make after much trial and error. 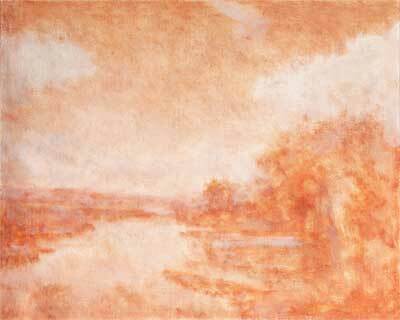 Underpainting in trans mars red with amber. While this seemed charismatic at the time, experience has shown me that this underpainting should be about half as dark. Final image, looking for the feeling without as much regard to the detail. 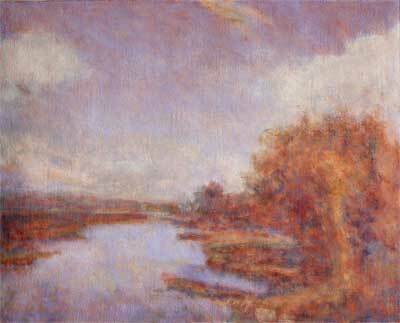 Corot type palette of earth colors with cobalt blue. Sometimes a painting needs to be made without too much planning, the energy leading. This is something the putty medium does well. But that doesn't always mean it gets finished quickly. 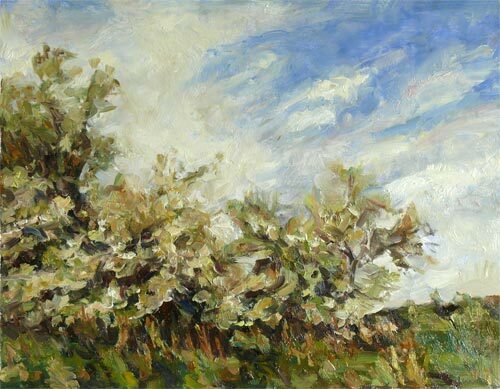 This image of wild apples went around in circles with a great deal of paint before I found something that felt like the day. First layer, about 14x18, had been working with the putty medium about six months, wanted to see what would happen if I simply went for it. 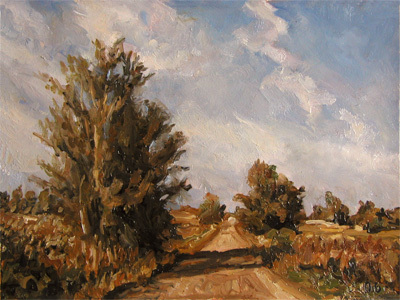 Blue sky landscape, always a challenge. Several layers later, still looking for a balance of energy and detail. More detail in the sky and trees. Ended up shifting it more towards the actual cooler tones of Spring around here. About ten working layers all told. An image from the farming region to the northeast of Florence: a favorite spot, an example of repeating an idea with various combinations of ingredients over time. All the same, all different, I'm intrigued by the resulting shifts in feeling and meaning. 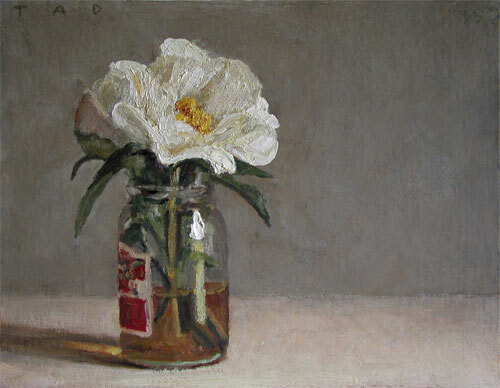 One of the alla prima studies done on site in the morning, medium was sun-thickened poppy oil on an absorbent ground. 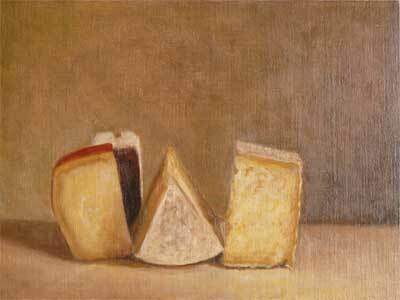 Pigments were vermilion, cobalt, green earth, yellow ochre, orange ochre, lead white. 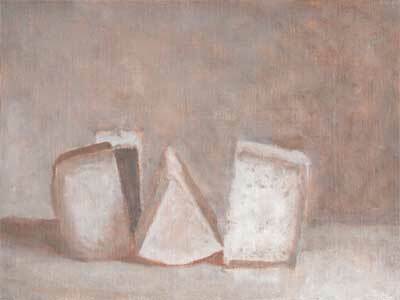 Oil on gessoed paper, 7x14 inches, 2000. 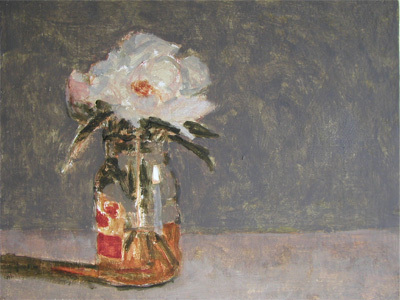 An early studio version using a simple balsam and sun oil medium. 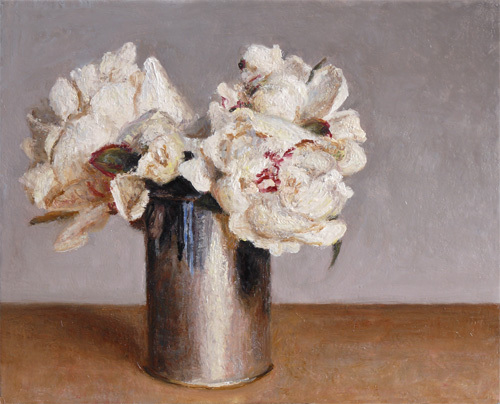 Oil on Claessens linen, 14x18 inches, 2003. 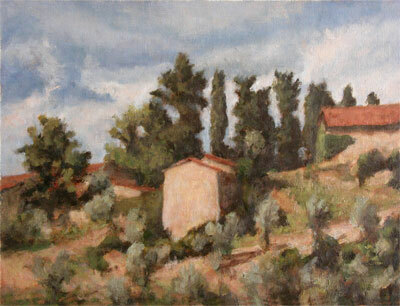 A larger studio version, again using a balsam and sun oil medium. 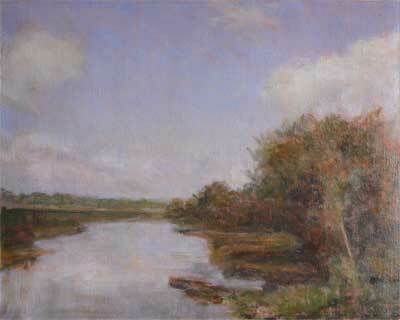 16x32 inches, oil on gessoed canvas over panel, 2005. 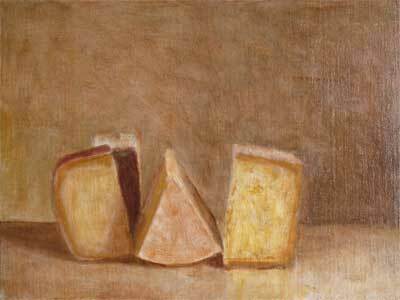 Alla prima studio study using a sandarac underpainting with a rich copal medium on top, looking for more livliness. 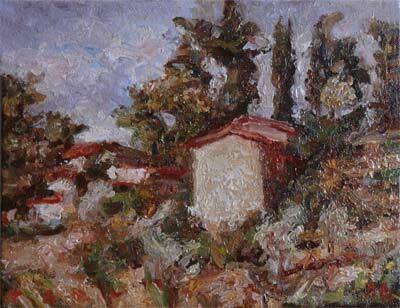 Oil on gessoed paper, 10.5x14 inches, December 2005. 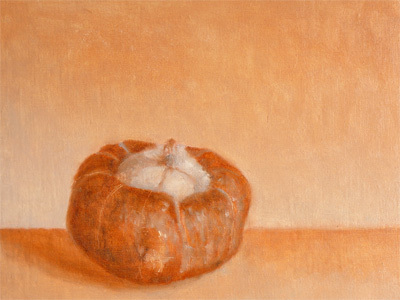 Alla prima study using an egg emulsion medium underpainting with amber enriched paint, an amber-mastic gel medium, and several homemade paints and pigment combinations, including -- crucially -- a white made in the manner of the Dutch lootwit. 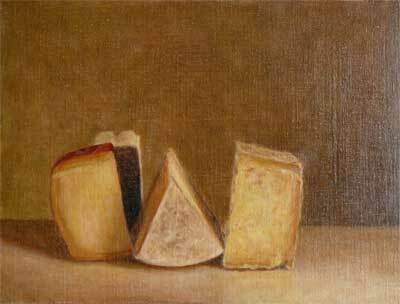 Oil on gessoed canvas over panel, 8x10 inches, December 2006. 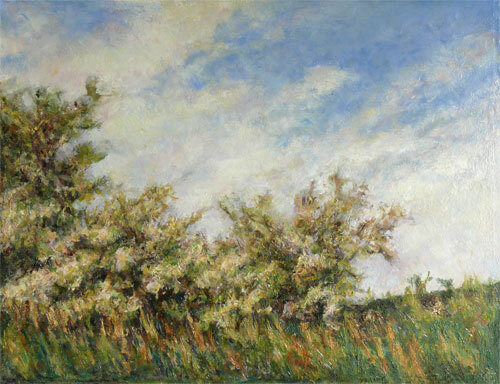 The result of trying to incorporate some of that Constable sparkle. A larger alla prima version, about 11 x 14 inches, done in January 07 using a similar set of ingredients. 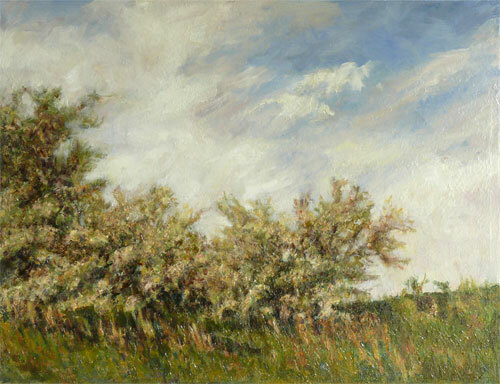 I don't do a lot of copying, but the Constable outdoor studies are tremendously interesting to me. 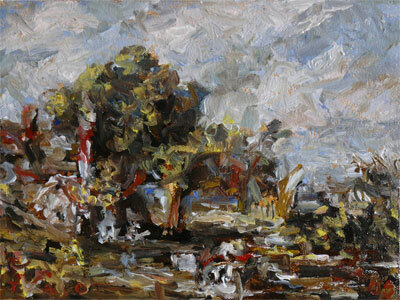 Below are two alla prima studies I did after an early Constable study for "The Hay Wain". I found the juxtaposition of observation with a tremendous element of color abstraction quite compelling. The original is around 5x7 inches. First try at figuring it out, had difficulties with the light yellow and with the intensity of the value scale but learned a lot. Living in Vermont, the idea of making a landscape without a green pigment is highly appealing! 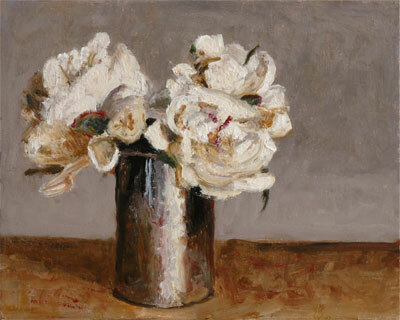 8.5x11 inches, oil on canvas over panel, a mastic gel medium similar to Roberson's medium of Pre-Raphaelite fame. 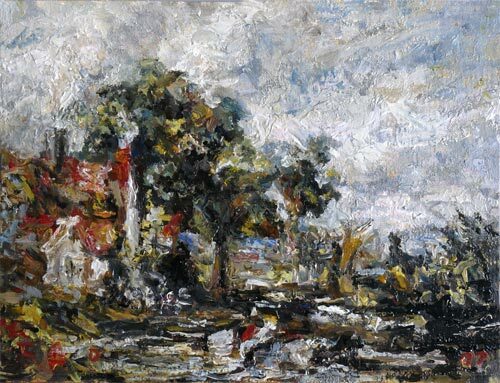 Used this on a hunch, the Tate conservation people having found that Constable used a great variety of materials, including mastic. Somewhat larger, done about as month later. Still had issues with the light yellow but saw the world much more easily on the terms he defined, the goal. Made the paint with a heat bodied oil, used amber varnish in the dark colors, silver fir resin in the light colors, with an adhesive lootwit style white I make containing marble dust. All this resulted in more crispness. This was a great deal of fun. The idea is to get comfortable enough with this system to work outside with it. Unlikely, but that's the idea. Beginning in light shades of gray with a small amount of red earth in the shadows can be effective if the end result is warm. Very light, relatively out of focus, just looking for feeling and positioning. Trying to keep it light, as my tendency is to make underpaintings too dark. Silica and ground leaded glass mixed with the paint to help it dry quickly. Next day: a warm transparent layer over the whole painting in various earth tones. 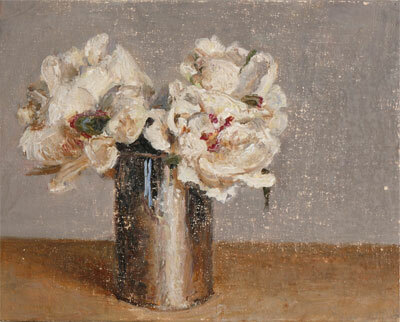 Same day as two, adding color on top which is lighter and contains white. Next layer, a few days later: darkened a bit with warm transparent tones, adding some detail. This photo was taken when this layer had dried and been sanded with 600 paper after being oiled lightly. The oil with paint is wiped off, then the painting is wiped with a clean rag with a small amount of turpentine. 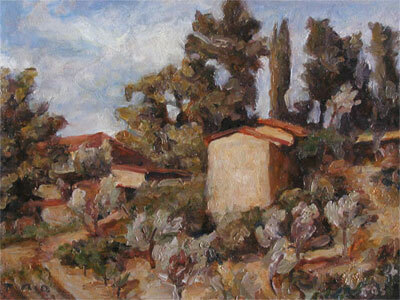 Cooling down the background and foreground, adjusting tone and detail in the objects, bringing the edges into focus. Not done yet, one more layer? From here this will be straightforward to finish...I hope. 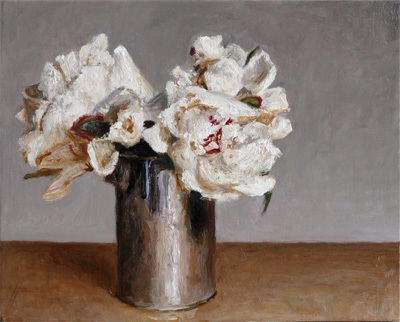 Oil on gessoed linen over panel, 12x16 inches. I put one more layer on it after this. Incredible variety can be obtained just using black, white, and a red earth. This is a technique which Eastlake discusses at the end of his Methods and Materials. 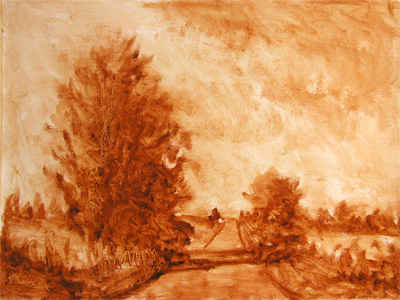 First layer on an absorbent ground, an image that became softly balanced between the three colors involved, use of burnt sienna for the red. An image that would become predominantly green, use of the very hot transparent mars red for the red, just a bit of cool gray. An image I feared would become too evanescent, so I tried to ground it as firmly as possible. The temperature shift between the transparent purple-blacks and the opaque grays gives a sense of depth. I agreed to do a local landscape group show at the end of September, but things I painted for the show kept selling. In the second half of August I needed to generate some finished work in a hurry -- not my forte! So I used a lighter to darker technique with this one, keeping the texture open and the darks transparent. 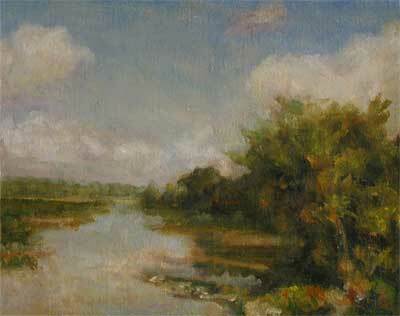 This was about 10x21 inches, oil on linen over panel, completed in two weeks -- unheard of! Sold opening night, always fun. Underpainting, very high key, use of fumed silica and ground leaded glass in the paint make it dry matte and lighter. Sanded with 400 paper and oil; wiped dry, wiped with turpentine. Then darker, trying to get the motion in the mist correctly. Sanded as above, then lighter. Sanded once more with 600 paper, then final slight darkening (transparent paint) and abit more detail in the distance. There was a gazebo near the top of the second hill on the left, just above the smaller emerging finger of mist. Decided to leave it out. This way of developing an image came about as a result of my umpteenth reading of Sir Charles Eastlake's mighty tome on traditional painting methods and materials. Near the end of volume two, Sir Charles talks about the need to do the most art with the least color in the first layer, and how this can be accomplished using three colors: black, white, and a red. 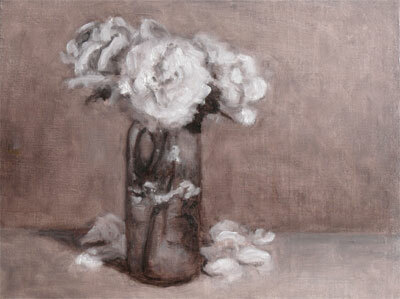 Original small 8x10 study done in one rich layer over a warm underpainting to see how this image might work out. Larger version, about 13x16. No grid, I need to change the original too much. 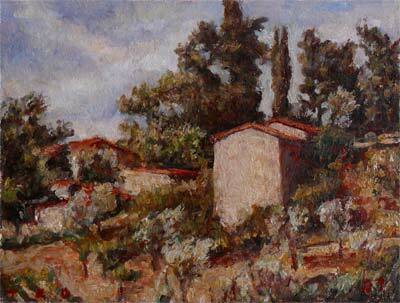 Soft focus, relatively light values using transparent red oxide, vine black, and white. All pigments were transparentized using ground leaded glass and fumed silica. Let it dry. Adding two more pigments: a light cobalt blue and yellow ochre. No more black. The canvas is a little rough for this technique, next time I'll make it smoother. Let it dry. Sanded it back lightly. Adding the rest of the pigments: green earth, raw sienna, burnt sienna, transparent mars maroon. Manipulating the major masses to lock the composition before adding lots of paint. So, my theory is that this is now ready for the "charismatic paint layer" of mighty legend. We'll see!